C&O Family Chess Center offers memberships for individuals and families interested in chess education, competition, and support of chess activities in this area. Members have free borrowing privileges from the center's extensive, dues supported, chess library (more than 600 books, magazines, and other materials). Other benefits of membership include free club ratings, C&O groups on Chess.com, discounts on lessons, books & equipment. 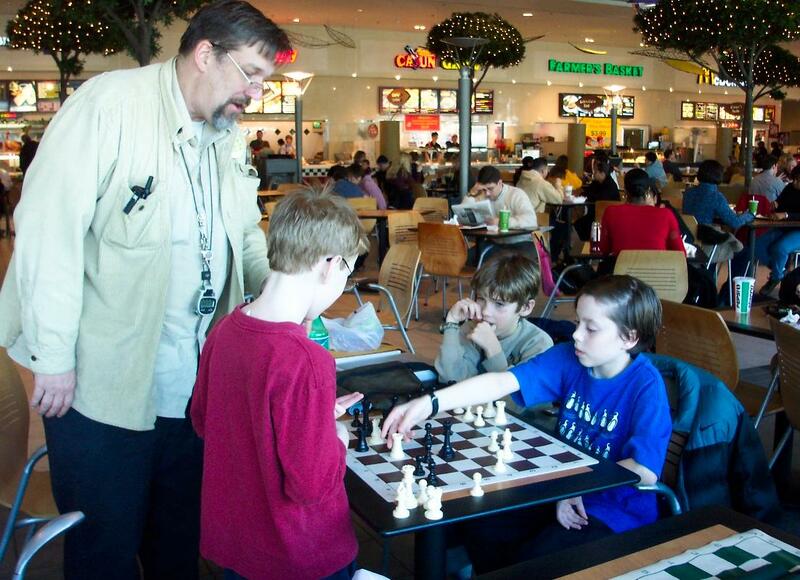 Members' dues also help support the largest free chess club in Maryland, the Chess Club at Lakeforest Mall (LFM), which meets daily, seven-days-a-week, in the food court. In addition coaches are available to help online with basic instruction and to direct students to our many in-house and online resources (including beginning, intermediate, and advanced classes and lectures on DVD and online), and hopefully online club tournaments and more. C&O Family Chess Center also offers online-memberships for individuals and families who have no scholastic program in their school or who want extra access to C&O coaches and programs. Of course all members may still use the free resources on our website. Regular and Online-Members may borrow items at no cost from our extensive library (over 600 items). Members may keep books or other items for as long as needed if no other member has requested the same item (lost or damaged items must, of course, be replaced). Some items do not circulate but may be used at the center by appointment. Membership dues are used, in part, to maintain and add to the collection. Donations of new or used chess books, CDs, DVDs, or other items are always welcomed. C&O Family Chess Center seeks qualified "Coaches In Training" (CITs), volunteers to assist in scholastic and club chess programs at the elementary and middle-school levels in both public and private schools, summer programs, and weekend classes. CIT applicants should be at least 14 years of age but need have no prior experience working with children. Chess experience is required (applicants should have a good grasp of chess fundamentals) however C&O Family Chess center provides a curriculum guide, classroom materials, and free training in our methods. Student volunteers who have been in our chess programs are particularly welcome. Due to the nature of our work volunteers over the age of 18 must be able to pass standard state and FBI fingerprint and criminal background checks. Those working in private schools may also have to take a short child-abuse & awareness course offered by the Archdiocese of Washington, or other groups. CITs and other regular volunteers will be given "membership" privileges, including discounts and library use. Volunteers with enough experience may qualify for "paid associate" status. Payment rates depend upon performance and class size. All paid C&O associates are self-employed sub-contractors. The C&O Family Chess Center does not withhold state or federal taxes, nor does it provide benefits or workman's comp. Most scholastic classes are held once-a-week on school days before or after school hours (minor time variations exist from school to school). One-week half- and full-day summer chess programs usually run for eight to ten sessions in June, July and August. Saturday morning classes are held year round, from 9:00 to 10:45 AM. CITs and volunteer associates provide their own transportation. If you are interested in becoming a CIT or volunteer please contact the center directly, by phone (301-963-9122), or at OPancoast3@gmail.com to arrange for an application. C&O Family Chess Center seeks qualified applicants to teach chess or assist in scholastic and club programs at the elementary and middle-school levels (K-8) in both public and private schools. Applicants should have some experience working with children in groups. Some chess experience is required but not the major factor in our hiring practice. C&O Family Chess Center provides paid associates with a curriculum guide, classroom materials, and training in our methods. Due to the nature of our work paid associates must be able to pass standard state and FBI fingerprint and criminal background checks. Those working in private schools may also have to take a short child-abuse & awareness course offered by the Archdiocese of Washington, or other groups. Pay for classroom aides starts at $20 per class session and for teachers/coaches at $40 per class session. Raises depend upon performance and class size. All paid C&O associates, whether teachers or aides, are self-employed sub-contractors. The C&O Family Chess Center does not withhold state or federal taxes, nor does it provide benefits or workman's comp. Most classes are held on school days before or after school hours (minor time variations exist from school to school). Teachers and aides provide their own transportation and are expected to arrive early enough to set up and remain long enough to supervise clean up and make sure all students have been properly dismissed or picked-up by parents. This should not usually involve more than a quarter hour before or after class. If you are interested in becoming a paid associate (aide or teacher/coach), please contact the center directly, by e-mail at OPancoast3@gmail.com to arrange for an appointment.